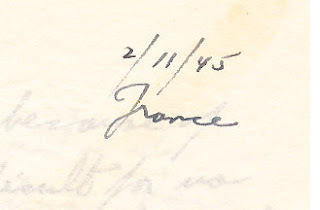 This letter was written by a soldier in France, during WWII, February 11, 1945. He was serving with the 919th Field Artillery Battalion. From the letter…..
Next Wednesday is the first day of Lent. Maybe this doesn’t’ mean much to you, in fact in the army it really doesn’t effect us. Wednesday is also Ash Wednesday, I am sure you have heard of that day. All this means that Eater will be here soon. Well enough for that talk, so now I will tell you what letters of yours I have received today. 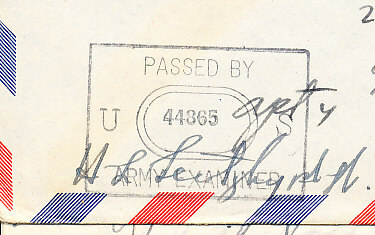 I received three letters dated as follows, Jan 20, 21, and 24th from you. Also received a letter from your Mother dated Jan 21st. I wish I could see a movie once in a while myself. I haven’t seen any in over a month. All it seems we do is work and sit in our room and write letters or play cards. I do however spend much time with the people in back, playing cards and trying to talk. When I say trying to talk, I mean because of our different languages it is difficult for us to try to speak and understand each other. Although I do fairly well. Last night I played cards again with the fellow, or I should say father of the two little children. And today believe it or not I had a real home cooked meal. Yes sir, a good meal. It consisted of sauerkraut, veal, fried potatoes, and the drink was not coffee, but cider. Yes, instead of eating dinner over at the Mess or our own kitchen I ate with these people. This was my second time that I was invited to eat with them. In your letter of Jan 21st you mentioned me learning you how to maybe cook dehydrated foods if possible. Well, Honey, don’t worry. I love you so much that I’m willing to teach you anything I know. I hope all your dreams come true, and if it is possible I will make them come true. I am sure we will be happy, and I know you will be the best wife any man could ask for, and I’ll try my best to be a good husband. We may have times, that will be tough and things wouldn’t be easy, but together we can’t fail in anything we do. And it will be a grand reunion, when my brother rand I get home again. I know that when my Mother and Dad, brother rand his wife, and you and I all meet it will be a day we all will never forget. Just keep praying for me, and I hope and am sure your prayers will be answered. And soon we will be untied together.